How did Underworld land this crucial role in what might be the biggest live performance the world has ever seen? What took them from Born Slippy techno-heads to gold-medal position on the winners' podium of mainstream culture? From lager-lager-lager to on-your- marks, get set, go? "It's Danny's choice. If he says we can do it, we can do it. And we believe him." It's not just because they're good friends with Danny Boyle - although their long relationship has spanned not simply climactic soundtrack moments but also Hollywood hook-ups (they contributed to his Ewan McGregor/Cameron Diaz vehicle A Life Less Ordinary); theatre (that Frankenstein collaboration, which ran at London's national Theatre in spring 2011 and resulted in a new Underworld album); and sound design (they helped score Boyle's innovative, digitally-shot deep space sci-fi Sunshine). It's not that they've retired from the festival-wowing life that peers The Chemical Brothers continue to pursue, or that they're necessarily wary of the resurrection shuffle being undertaken by contemporaries Orbital and Leftfield. And Underworld certainly aren't offering baby-boomer mates-rates to Olympic overlord Seb Coe, even though, at 55, the knighted sportsman-turned-politico is pretty much the same age as Smith (53) and Hyde (55). No, the fact that Underworld were commissioned for London 2012 reflects several things: their achievements as electronic artists, as spread over six studio albums; their renown as live performers non pareil - Underworld know how to put on a sensory-busting show better than most two-blokes-with-decks-and-keys outfits; and their multi-disciplinary interests. Hyde and Smith have published books and hosted online radio projects, developed other artists, and have staged art exhibitions around the world, solo, in tandem and with the design/ advertising collective Tomato. Their hiring speaks of something else, too. The 'maturity' of electronic music. Only a very few artists survived the first, early-90s rave era flush of bangin' tunesmithery. Only a handful of that few understood the importance of making music that didn't depend on a club environment - or, let's be frank, the drugs - to be enjoyed. And barely any of that handful of that few had the nous to make that music, and continue making that music. And to improve on that music. "Yes, we'll always continue to be the Underworld that makes dance music." But Underworld, perhaps alone, did. So here they are now, burning as bright as the Olympic flame. Why are you the men for this job? Smith: "'Cos Danny says we are. That's the bottom line really. It's his choice. If he says we can do it, we can do it. And we believe him." Hyde: "This thing about this project is, it's being done by Rick and myself. 'Underworld' as people know Underworld are a band that was made famous by the tune Born Slippy being on Trainspotting. Millions and millions know that. Hundreds of thousands know Underworld as this group that goes out and takes this huge, celebratory music to large audiences around the world. So that's largely the Underworld that most people know. And what our future is about is taking that and making a richer picture. "Yes, we'll always continue to be the Underworld that makes dance music. But there's these threads that have been intertwined throughout our 30 years together that we will be exploring for the next 20-odd years, or however long we're given on this earth. And the Olympics and the national Theatre and film scores and the exhibitions and all those other things are part of what we intend to be doing more of - while continuing to celebrate with tens of thousands of people on stage." 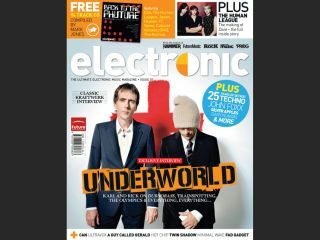 For the full Underworld Interview check out Electronic Magazine. The new mag for electronic music fans. No gear reviews, no walk throughs, just up close and personal with the artists you love. Don't miss it. Includes a free 14-track CD compiled by Mark Jones!